The Guardian Pink Rollator from Medline has a comfortable padded seat with easy to use loop breaks, height adjustable handles for specific user heights. The attached carry basket beneath the seat provides security, yet is easily removable to carry with you. The Pink Rollator weighs only 15 lbs and it's lightweight aluminum makes transporting easy. This Rollator features a beautiful pink frame and the Breast Cancer Pink Ribbon logo is heat-transferred on the seat as well as embroidered on the backrest cover, so you always showing your support! Lightweight aluminum frame weighs only 15 pounds! Help Support Breast Cancer Awareness! Since 2005, Medline has donated more than half a million dollars to fund breast cancer education and free mammograms for those in need. In addition, Medline offers a variety of Pink Ribbon products to help promote Breast Cancer Awareness. Always get comments about the color which is different from most. Works quite well and is very sturdy. Supports Weight. Stores Easily. Lightweight. Safe. Easy To Use. Travels easily. Well Constructed. Short Distances. Outdoors. Long Distances. Indoors. Well Constructed. Supports Weight. Stores Easily. Indoors. Short Distances. Long Distances. Outdoors. I am 63 years old. I fell down a flight of stairs and have severe damage to my spine and partial paralysis of my right leg. I was using a standard walker but when I saw this beauty on your web site, I knew that it would work better for me. Standing in line at the market, etc. is just intolerably painful for me. This little beauty helps keep me more independent and able to function. Thank you for offering this little lady. Stores Easily. Well Constructed. Lightweight. Safe. Supports Weight. Easy To Use. This walker is great for my 95 year old mom - not very strong but able to do the brakes. The sparkles in the paint put sparkles in her eyes. She loves it - the basket is very handy and the pocket under the seat is great to keep the manual and the little adjustment wrench. Asked on Jun 23, 2015 3:32:17 PM by Gwennie from Santa Maria, Ca. How wide are the wheelchairs??? Q#1, #2: Re: Pink 4 wheeled Rollator Outside 24" across wheels, 25" at handles;The seat measures 18" wide inside. [I can park my tail in it, and I am shaped like Pooh-Bear: "Short, fat and proud 'o that!"] When "folded" it should fit in a space 36" x 22" x 19"; Fits through my 27" smallest indoor doorway. Both of my (grown) sons have SUVs and can fit it without folding, remember to engage breaks. Q#3: Wheels are standard 7-1/2" size, would need to be changed by someone with needed equipment (perhaps a bike shop?) Q#4: Again a question for a dealer; perhaps a small "sleeve" of lambs wool might help your mom's hands; also it is possible that she is gripping too tightly, it rolls easily on flat ground, yet it is very steady. Be sure the height of handles is adjusted for her height. Q#5: I would strongly suggest you consult the orthopedic doctor regarding a child's size; there are many different kinds of walking aids depending on the disability; and/or if it is for a small adult or child. Also a dr. can write a Rx for the appropriate style which might make it tax free. Hope that helps. Totally LOVE mine, and I also got one for my ninety-something friend, and she loves hers also. It is more sturdy than the one I had been using, and is totally SILENT. My friend was delighted saying her was the prettiest one she'd ever seen. How wide is this rollator? Can the wheels be replaced? How much would that cost to replace all 4? My Mom has a walker with hard plastic grips/handles and it bothers her hands and wrists. Do they make different grips for walkers or walkers with softer,foam grips? Do you guys ship this item over seas? and if so how much it would cost?? 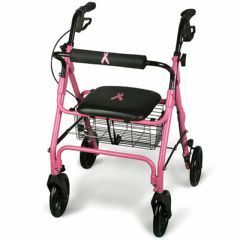 how wide is the wheel base on the breast cancer rollator? Asked on Nov 20, 2011 2:17:17 PM by debsmis from houston,s.c. How many lbs does the Rollator hold? Do you honor Medicare and Empire Insurance? How many pds will it hold? How wide is the seat?